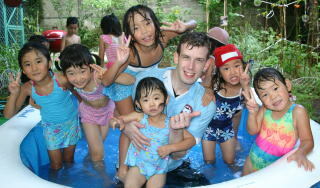 Special reduced prices for families that demonstrate excellent English skills! ●Only 4 scholarships are available for KIS Futakotamagawa Kindergarten. ●The student(s) will retain the scholarship until graduation. ●Required uniform and supplies (textbooks, etc) as well as maintenance fees are not included. 1. The Scholarship is reserved for students between the ages of 2 to 6 years old. 2. At least 1 parent within the family must speak fluent English. 3. Both the student(s) and parents must pass an interview.